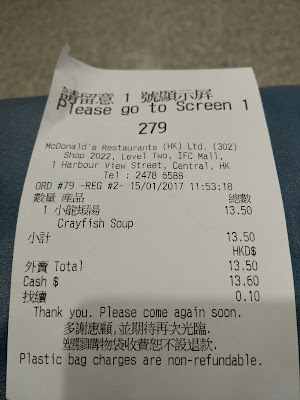 A couple days after I had tried the Bagel Deluxe Breakfast & Purple Rice Soy Milk, I visited a branch to pick up the only promo item currently on the McDonald's Hong Kong lunch/dinner menu that I hadn't already tried before, Crayfish Soup. 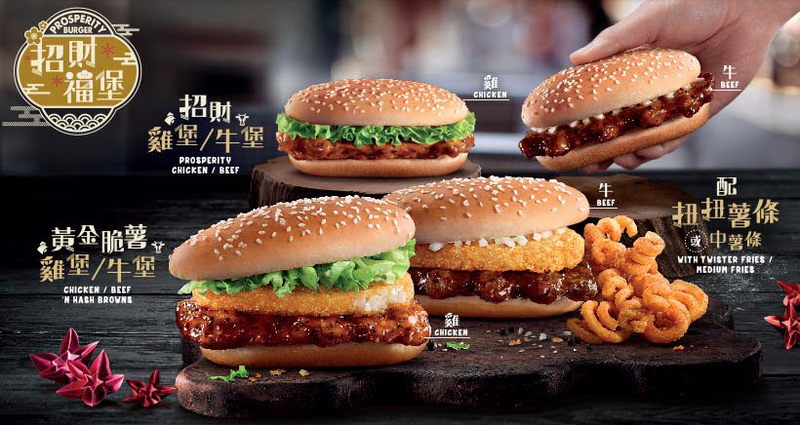 Travelling around Asia on the hunt for new burgers before (and after) the Lunar New Year period is challenging, as most countries run the Prosperity burger, or a variant of it and I have no interest in repeatedly trying the same burger over and over again. Since that burger occupies the 'promo' burger space, I'm pretty much limited to trying one of the side dishes or a breakfast item if they happen to have one, and this last trip to Hong Kong was no exception. 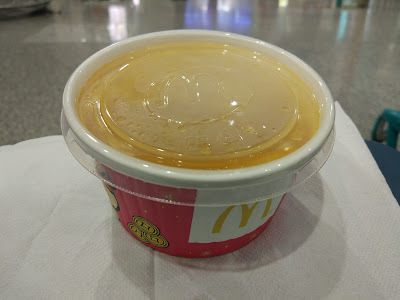 The far-too-small IFC McDonald's didn't have any open seats so we ordered the soup for takeaway and brought it downstairs to eat whilst waiting for the Airport Express. You might remember those ugly blue chairs from when I ate the Beef & Egg Fan-tastic off the same seats back last June. 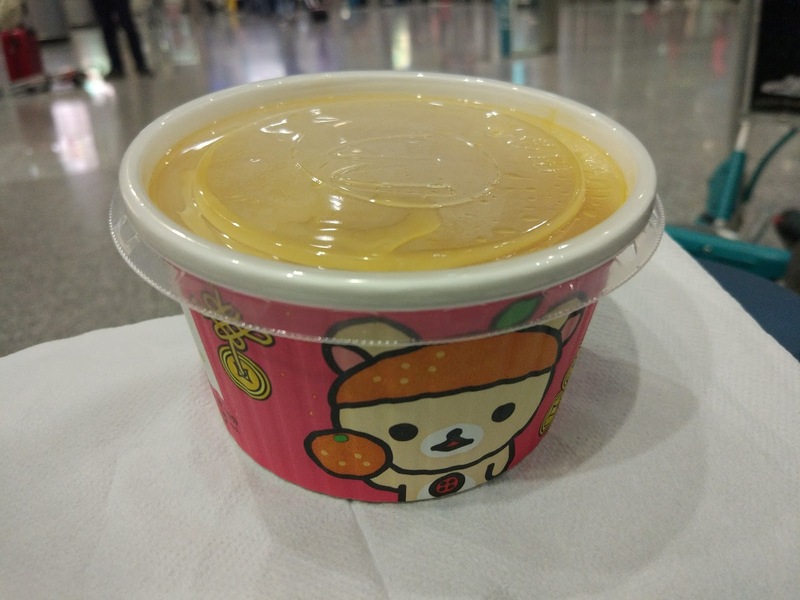 I thought about leaving it to try from the actual airport itself, but they have a tendency to run out of the promos quicker than the in-city branches, and I didn't want to risk it - I've been burned before. 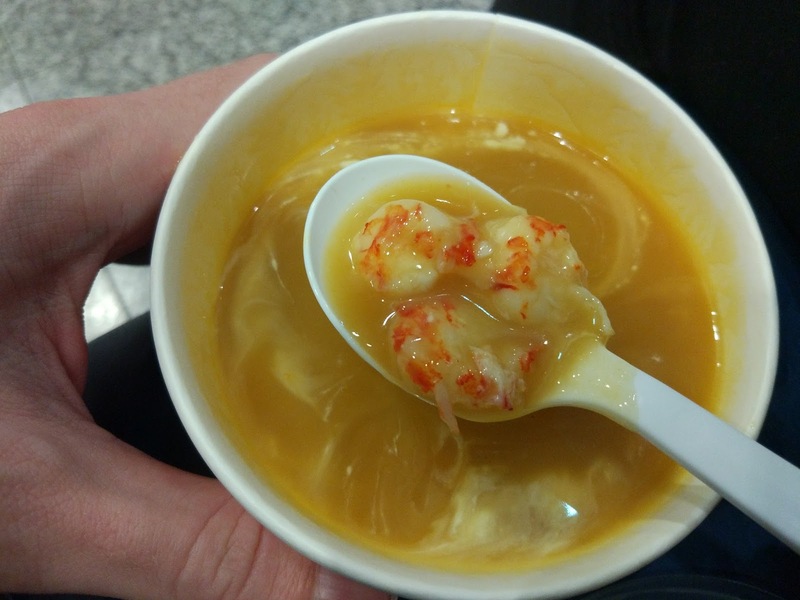 I might be mistaken, but I believe the first time the Crayfish Soup appeared in Hong Kong was back in early 2013, and it has pretty much made an appearance about once a year since then, but I've never been able to try it. When I transited through Macau last year (which shares their menu with Hong Kong) it was already sold out in every branch I checked. This year I was lucky enough to see that every branch still sold it, so I wasn't too worried about leaving it until my last day. Just like the Pumpkin Soup I had in Hong Kong back in 2012, this was a semi-thick cup of soup, topped off with a dash of fresh cream. 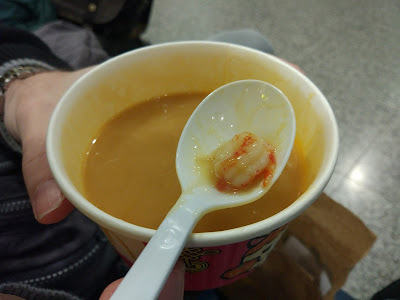 I had a cold at the time, so the wife took the first couple bites as we didn't risk sharing the bowl after I've used the spoon, and mentioned to me that there were four large pieces of crayfish, so we agreed she'd eat two pieces of fish and leave me with the the other two. 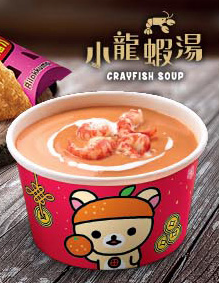 The meat was actually pretty damn impressive for McDonald's, as each piece was easily the size of a medium sized crayfish. I went in expecting the soup to only have a few shavings of meat to keep costs down (which reminded me of the Crab Croquette Burger from Japan) so to find these large pieces was a welcome surprise. They were firm, but not overcooked, and each was a slightly different size and shape from the rest, which is always nice to see as it looks better than processed uniformity. An even better surprise was that when The Wife passed the bowl over for me to eat, there ended up being a total of six pieces in our serving, as I fished out four of my own. 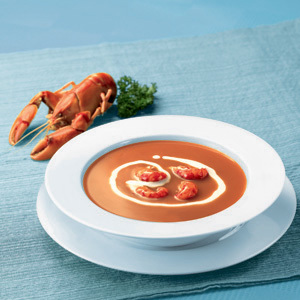 Unlike the Pumpkin soup, the cream actually added some noticeable flavour to the lobster-bisque-esc broth. 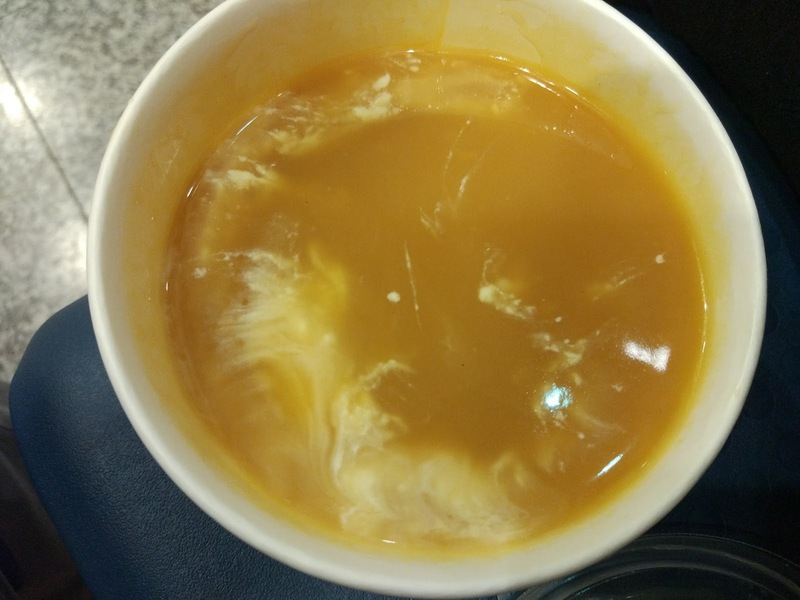 There weren't any large pieces of vegetables floating around in the broth itself, but the broth clearly was made onions and some 'heavier' vegetable (maybe a potato or yam?) that I couldn't quite place. 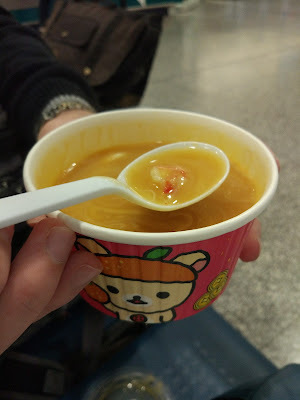 It wasn't creamy, so it didn't have that unhealthy heavy feeling I get after eating a cream based soup. There's not really much else I can say about this soup, as it was only made up of the three ingredients, broth, crayfish and cream. 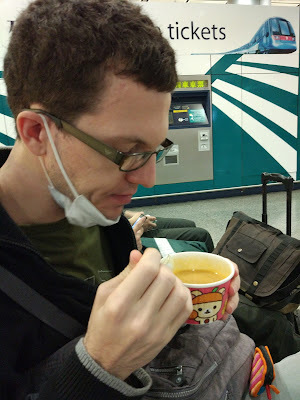 The broth did wonders for my cold and I drank every drop I could before boarding the train back to the airport. Long time readers will know that soup pops up at McDonald's every now and then, and I find that it's usually a hit or a very big miss. 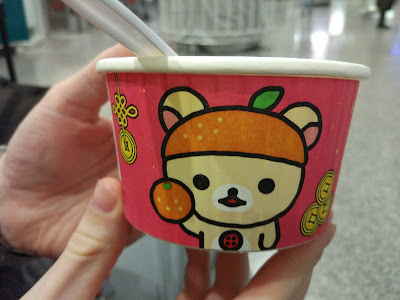 This one was firmly a hit in my books, and I'd happily swap out my fries for it whenever I have the opportunity. Who wouldn't want to eat out of that cup? !